James Yorkston is one of the premier artists of the British folk music scene. His songwriting complimented by the music of his Athletes band, holds a minimalist structure that is quiet soothing to the ear. 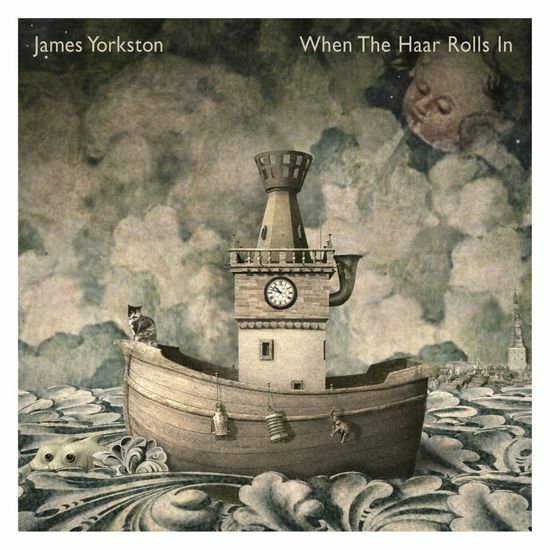 What I like about James’s music, especially on his most recent release: When the Haar Rolls In is the warm feeling you get while listening to his singing set to the gentle plucking of acoustic guitar. On a cold day with a warm beverage, this music is perfect listening while kicking back and doing absolutely nothing. To hear an audio review with music click below. If you are interested I can email you the tracks. Thanks- Have a Great Holiday! We are living in a time of stress and struggle. There is still hunger, hatred, and sickness in a world that is also filled with such beauty, generosity, and harmony. ASCAP award-winning composer Wendy Loomis and Eastman School of Music alumna Monica Williams decided to create a CD that had the power to help people relax, de-stress, and energize with positive vibrations of gratitude for this life. While Wendy was in the middle of a yoga class, she had a vision of the CD being organized around the 7 chakras. For those of you unfamiliar, the 7 chakras are energy centers that run up the human body from the base of the spine, to the sexual center, the stomach, the heart, the throat, the 3rd eye between the eyebrows, and the crown of the head. Many people have developed systems that associate colors and tones with each chakra. Monica and Wendy decided not to be quite so literal in their interpretation, but rather incorporate the idea of energy rising from our most earthly, primal instincts up toward our higher, nobler, spiritual realm – the eternal quest to ascend toward the Higher Power. And ASCENSION was born. 7 is a lucky and inspiring number that is threaded through ASCENSION: there are 7 tones in a scale, the compositions are in 7 different key signatures, the music is played on 7 primary instruments, Monica was born in ’77, and this is the 7th CD of Wendy’s music. With the exception of ‘Seed’ and ‘Nourishment’ which were improvisations, the themes for this CD were composed by Wendy Loomis. Monica and Wendy arranged the flute and piano sounds in a weave with instruments from around the world played by a group of very talented women: Jennifer Lim on guzheng (China); Debra Podjed on tabla (India) and goat hooves (Bolivia); Jessica Styler on hang drum (Switzerland); Suellen Primost on cello (Italy); Irina Mikhailova on voice (born in Russia); and Karen Segal on guitar (Spain/the Middle East). Contact me at monicaw14@hotmail.com– if you are interested.